On Thursday, three events are occurring simultaneously at the Antioch Community Center during food Truck Thursday which include Big Trucks and the Red Sand Project. All kids LOVE Trucks! 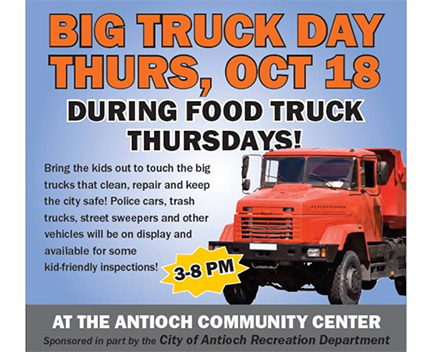 Come see and touch the big trucks that keep Antioch clean and safe – from the Police Department emergency/SWAT vehicle to the Public Works backhoes and water trucks. Large Transit busses, garbage trucks and more will be on hand for everyone to see. 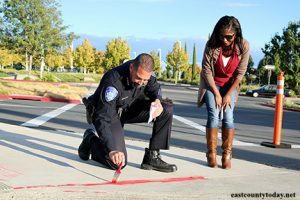 Councilwoman Monica Wilson oversees Police Chief Tammany Brooks placing red sand in the cracks. Red Sand Project is an artwork that uses participatory sidewalk interventions to raise awareness of the vulnerabilities that lead to human trafficking. 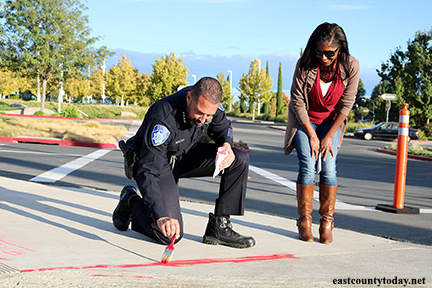 The Contra Costa Human Trafficking Coalition, in collaboration with Councilmember Monica Wilson, Chief Tammany Brooks, City Manager Ron Bernal and city staff, invites the Antioch community to take the time to fill sidewalk cracks with red sand and document their sidewalk transformations on social media using #RedSandProject. Through this project and the community’s support, we can bring awareness to human trafficking in Antioch. PARTICIPATE: Free toolkits will be distributed to the public by the Coalition in front of the Community Center beginning at 4PM.